The Smart Home is becoming a reality with the introduction of connected lights, plugs, lamps, refrigerators, coffee makers, thermostats, security systems, and so much more. Consumers can increasingly turn to technology to ensure that their home is safe and efficient, yet, they aren’t. Consumer reviews of connected home devices have been consistently decreasing since January of this year, and in our experience, less reviews equals less demand, which equals less sales. Though there have been several projections of IoT growth, it appears that after Home Automation peaked the interest of early adopters in 2014, typical consumers are not currently compelled to purchase connected home devices…and who can blame them? Connected devices have been plagued with connectivity and usage issues that are arguably causing more trouble than they are worth. In a market segment with so much potential for change, consumers are waiting for a polished product that does not skip footage when the WiFi disconnects or force them to use their smartphone to open their front door. Canary is an all-in-one do-it-yourself home security system. With several sensors packed into one device, Canary “blends deep learning technology with human-centered design to solve problems that all people share.” This idea of using technology to solve human problems has propelled this company through a wildly successful Indiegogo campaign and recent hefty series B funding. Now that the product is on the market, consumers are intrigued. 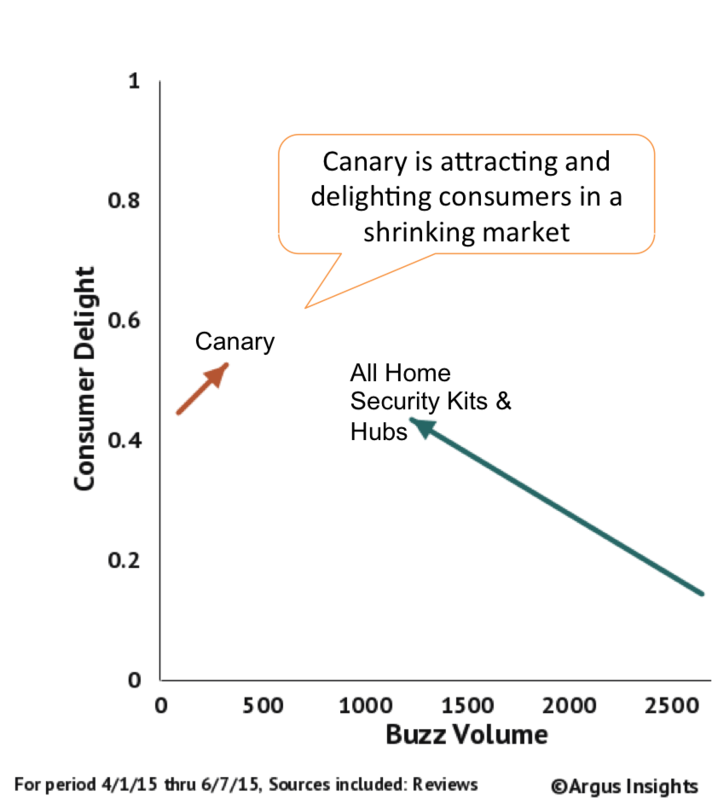 Canary is seeing growing interest and delight from consumers, while the rest of the market is losing attention. The connected home market is full of potential, but companies must ensure that they are addressing human needs, and most importantly making life easier instead of introducing technological barriers along with innovation. Canary is seeing initial positive response for their efforts, and Argus Insights will continue to track consumer perception of the entire Home Automation Market. Keep updated with our free weekly newsletters in the Home Automation, Wearables, Smartphone, and SDN & NFV markets.